All those plants, by now, have decided whether they'll do well or have given up the ghost. The front garden is amazingly full despite losing the peach tree this year. I harvested garlic and will have another harvest in another week. The garlic that put up scapes needs 20 days after the scapes were harvested before the cloves are dug up. But I have a good size haul of garlic cloves that had no scapes. They are hardening off before being stored for the season. 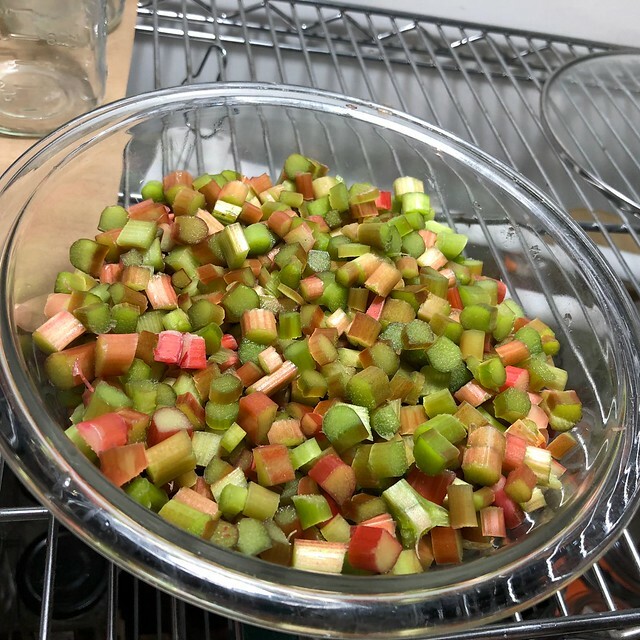 Bonus, I got in one last harvest of rhubarb before the weather turned stupid hot. Harvesting takes a lot of time. Chronographia has been collecting the raspberries while I worked on mulberries. Thankfully, mulberries are done for the season now, but the red raspberries are slowly ongoing. Beans and peas are ripening too. We harvest those every other day or so. A handful here and there. The cucumbers are starting too. There aren't enough to can. We are making refrigerator pickles instead. Hoping for enough raspberries to do a jam or jelly. Three quarts minimum. So far, I have 2 and 1/2 cups. I planted 16 beets from Renee's Seeds. I got zero. Although two did pop up in another bed, after I massively dumped the whole packet of seeds into that bed, very poor performance. I planted a lot of new seeds that were all no-shows, kohlrabi and Swiss Chard. I threw two whole packages of lettuce seed into one bed. No lettuce at all. Sad. Some of the most expensive seeds have the worst germination rates. I broadcast Parisan Carrot seed from the MI Gardener in two areas. Both are coming up now. Parisan carrots are round little balls like radishes. 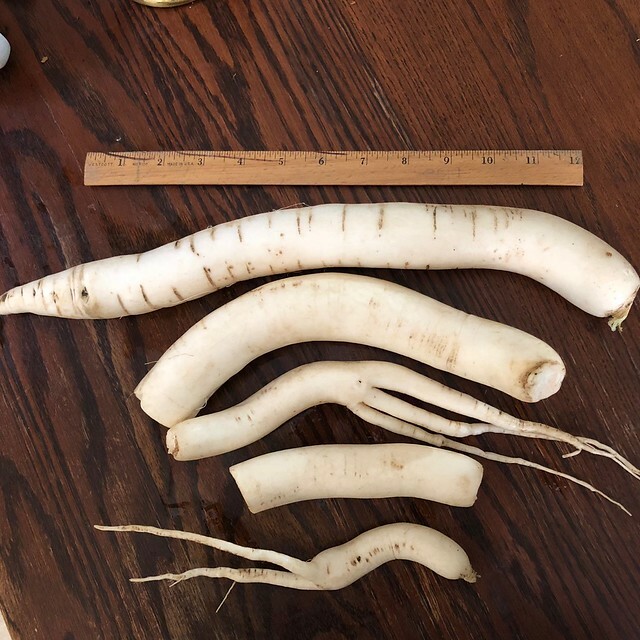 And although the French Breakfast radishes did come up, they don't have a radish as their root. The roots are thin and wispy. It's like they were a hybrid that reverted. Oh well. Still waiting for zucchini's to produce a female flower. The plants are big. The other squash are way behind in growth. Potatoes will be ready in another week or so. Apparently I missed some when harvesting last year so those potatoes got an early start. Looks like those are French Fingerlings. Can't wait! The peas are on a five ft high fence. They climbed 6 feet and managed to tip over the whole fence in the last heavy rain. I restaked the fence. The peas are still producing. Fortunately I planted them in shade. It will be over 90° each day for a whole week. The elderberry also tipped over. I staked it and hilled the roots. Looks good. Deer or ants will probably get the berries. Still, I have hope. The song sparrows have designs on my blueberries. Next year, I hope to get them covered sooner. The black current is in its first year of production. We'll get a handfull. I picked up a second black current and have hopes for next year. I'll dry them for scones. Not much sign of red currents this year either. Late frost? Sparrows? Who knows? Next up, making a new bed for a Persimmon tree. I don't have a tree yet but need to sheet mulch over some heavy weeds. It'll take a while to kill those off. I'm thinking three layers of cardboard over the burdock and pokeweed. Then, I'll cover it with compost and wood chips. I may wait. Chrono says a sunflower just popped up back there. I will never take good quality topsoil for granted again. We don't have any here. It takes nature 1000 years to produce an inch of good topsoil. Composting is the best way to create your own or put back what you take. Be thankful for every meal you eat. Farming is time consuming and hard work.